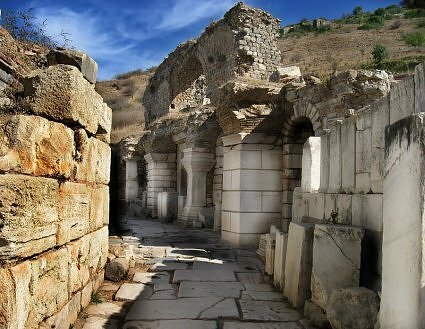 Ancient Ephesus was an important port city. Silting of the harbor however, has gradually moved this now historic archaeology site inland to be land locked. 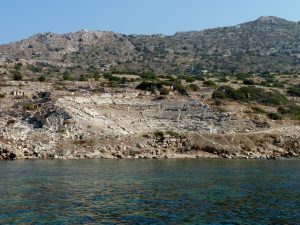 Cruising into the port city of Kusadasi, Ephesus is only 15 minutes away by land and well worth visiting as a day trip for a guided tour of the extensive excavations that have taken place over the years of this once vibrant economic and cultural center of ancient civilizations. Ephesus, founded in the 7th century BC, was the most important Greek city in Ionian Asia Minor and was noted for the magnificent Temple of Artemis, one of the seven wonders of the ancient world. By the 2nd century, Ephesus was home to 300,000 people and a major center of trade. The theater could seat 25,000 and the Library of Celsus was second only to Alexandria’s. Located in western Turkey, near modern day Seljuq, over 6 km from the coast, it’s hard to imagine that this city was once a major seaport. Emperor Constantine built the long colonnaded walk, the Arkadiane, from the theater to the harbor in the 4th century. However, by that time silt from the Cayster River, which today meanders lazily through the plains beyond the ruins, was already filling the harbor. By Byzantine times, the harbor was useless, and the site nearly forgotten until archeologists began uncovering parts of the city in the mid 19th century. 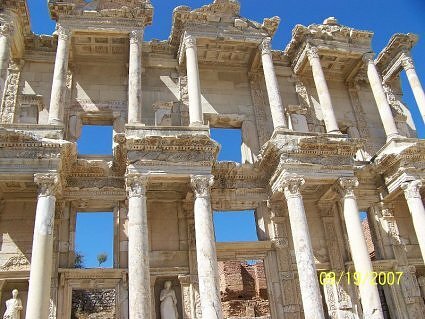 Ephesus is unparalleled in the number of well preserved ancient ruins. There are over 30 structures, museums and ruins to tour as you walk along the ancient streets of Ephesus and include the Agora, Celsus Library, Aqueduct of Sextilius Pollio, the Harbor Baths and the Stadium. Also, to the right of the road leading to Kusadasi are the ruins of the Temple of Artemis (Diana). Artemis was the virgin goddess of nature. The ruined Artemision contained a total of 127 columns, the 36 facade columns being decorated with carved reliefs. It was 115 meters long, 55 meters wide and 18 meters high. The Ephesus Theatre, which had a seating capacity of 25,000, was first constructed during the Hellenistic period, although the present structure dates from the 1-2nd centuries AD. The Roman Theatre was begun during the reign of Claudius (34-41 A.D.), and it took 60 years to build. 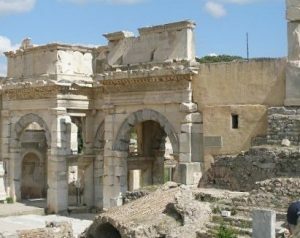 The Temple of Hadrian is on the street of the Curettes, and is one of the better preserved buildings at Ephesus. According to the inscription over the architrave it was constructed by P.Quintilius during 118-138 A.D., and dedicated to the emperor Hadrian. Opposite Hadrian’s Temple are the excavated Terrace Houses, which were built on the slopes of Bulbul Mountain. Their name comes from their design, with the roof of one house providing the terrace for the higher structure. The important and wealthy of Ephesus were residents of these “houses of rich” when built from the first century BCE, and continued until their restoration period in the second century CE. Although plain from the outside, their interiors were decorated with mosaics and frescoes and designed with opened ceiling, interior peristyles. Although these houses were mostly two-storied, upper stories collapsed after the last structures were abandoned in the 7th century. Excavation continues with two houses fully restored. Visitors can see plans of houses which had living and dining areas on the first floor, bedrooms on the second, and heating systems provided by hot water that flowed beneath floors and behind the walls. Visitors can also view current restoration projects with frescoes and mosaics in situ. Visiting Ephesus when traveling to Turkey is a “must do” in your yacht charter itinerary.